Britain’s top counter-terrorism officer has resigned, the London mayor’s office said Thursday, a day after he accidentally exposed a sensitive document about a terrorism investigation. Police were forced to bring forward the timing of a series of raids after Metropolitan Police Assistant Commissioner Bob Quick unwittingly revealed the names of those to be arrested. 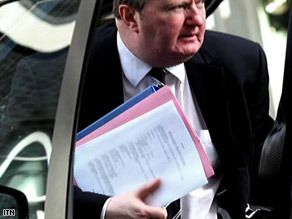 Quick was photographed as he got out of a car at Prime Minister Gordon Brown’s residence in London and the names were easily to read when the images were enlarged. London Mayor Boris Johnson said he had accepted the resignation with “great reluctance and sadness,” the Press Association reported. Watch as 12 arrested in major anti-terror raid Opposition politicians had demanded that Quick’s resignation after the blunder. Shadow home secretary Chris Grayling described it as “an extraordinary and very alarming lapse. “It’s the kind of error that Britain’s most senior anti-terrorist officer simply can’t afford to make.” Meanwhile searches were continuing at addresses in northwest England Thursday after hundreds of officers raided 10 properties and arrested 12 men – including 10 Pakistani nationals on student visas and one Briton. The men arrested were involved in a “very serious” plot closely associated with al Qaeda and escaped al Qaeda operative Rashid Rauf, whom British intelligence have linked to the 2006 plot to blow up trans-Atlantic airliners, according to a security source with knowledge of the investigation. The new plot was not believed to be targeting national infrastructure, such as rail lines, airports or utilities, nor was it clear if the plot was to involved bombs or an assault involving gunmen, the source said. The source also said authorities do not believe the targets would have been in the north of England, where the arrests took place, and that at least some of those arrested were Pakistanis in the United Kingdom on student visas.